The pastel blossoms of May and the big, showy blooms of June are all lovely and fragrant, but the deep colors and unusual shapes of fall flowers have exactly what is needed to stand out as more than just “pretty” in a bouquet or floral arrangement- character. When the days start getting shorter and the nights a little crisper, the following 3 flowers are at their prime. They may be late bloomers, but all of them are well worth waiting for and, along with warm sweaters, pumpkin spice lattes and the sound of leaves crunching underfoot as you walk, are a part of autumn to look forward to every year. This ancient grain has many ornamental varieties that are starting to make their pilgrimage from Central and South America to the florist’s cooler. Many local growers have started planting this fabulous fall flower for both its ornamental as we as edible properties. Tall and lanky, the unusual flower is plume-like, with feathery seed heads that can be upright or droopy and highly pigmented leaves. In colors such as deep, blood red and coppery bronze or a perfectly puce green, these tall stems can be draped throughout a bouquet or vase like a well placed scarf and add both vibrant fall color as well as an elegance of natural ease that’s hard to imitate. A favorite at farmer’s markets and florists alike, choose stems that have a firm base and a few leaves to determine freshness. In the language of flowers, the amaranthus represents immortality, but expect them to last only about a week or two as a cut flower. Save the tiny black seeds once the flower is spent and plant them next spring if you want them to actually live forever. In the language of flowers, dahlias represent dignity, gratitude and good taste. While it’s true that these showy blooms are available all summer long, there are several cultivars that are stunningly autumnal in their color. 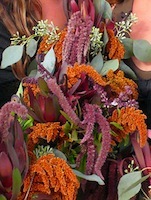 Deep oranges and chocolatey browns can be mixed with green hypericum berries for an earthy look, or gold or burgundy ones tucked into the plumes of amaranthus for a fall arrangement that is dripping with class. Ranging in size from a silver dollar to a dinner plate, dahlias are diverse and dazzling in both their shapes and color. Choose stems with both opened blooms and unopened buds for a more natural look. Technically not flowers at all, these unfurled fronds of ferns are the tall boots of fall flower arrangements. Tuck them in with their curled tops sticking up about 2 to 3 inches about the other flowers for a touch of whimsy. In both green and darker browns and blacks, fiddlehead fronds are a perfect accent to any arrangement and add a certain reminder of the changing natural beauty that fall brings every year.